Hot Italian sausage has been a part of my life since I can remember being me. I grew up in New Jersey, in a town called Westfield that supported more than a dozen Italian restaurants, serving a sizable Italian American population. Sausage, peppers, and onions was a staple dinner, spaghetti with sausage, pizza with sausage, stromboli with sausage… you get the point. Always, there were two kinds: sweet and hot. Sweet looked more or less like any sausage, but the hot Italian was always red — sometimes red from just chile flakes, sometimes because it had a little paprika in it. This made the easy to pick out in a big platter: Red ones spicy, white ones sweet. I always found myself reaching for the hot ones. Spicy, but not crazy hot, Italian hots are more warming and zippy than blistering. Just enough spice to make things interesting. Here is my version of that classic link. I do use paprika, or, rather, piment d’espelette, a mildly hot pepper powder not unlike Hungarian hot paprika. It helps to give the sausages a nice color and heats them up without resorting to cayenne, which is far hotter. Pork is a must here. I use wild pork from feral hogs I hunt, mixed with domesticated pork fatback, which is the fat on the pig’s back. It is the best fat to use for sausages, as it is harder than belly fat or fat from within the shoulder; both are fine if you can’t get fatback. How do you cook these links? 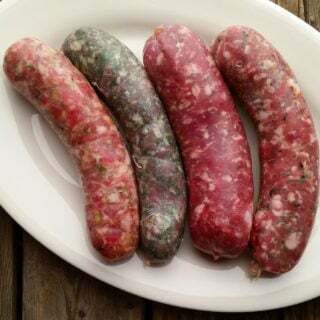 You can cook them in a pan, or grill them, or just submerge the sausages in some spaghetti sauce. Me? I prefer my links in traditional sausage, peppers and onions. Here is a recipe for it that I developed with my friend Elise from Simply Recipes. Incidentally, if you are looking for a sweet Italian link, here is my recipe for sweet Italian sausage. 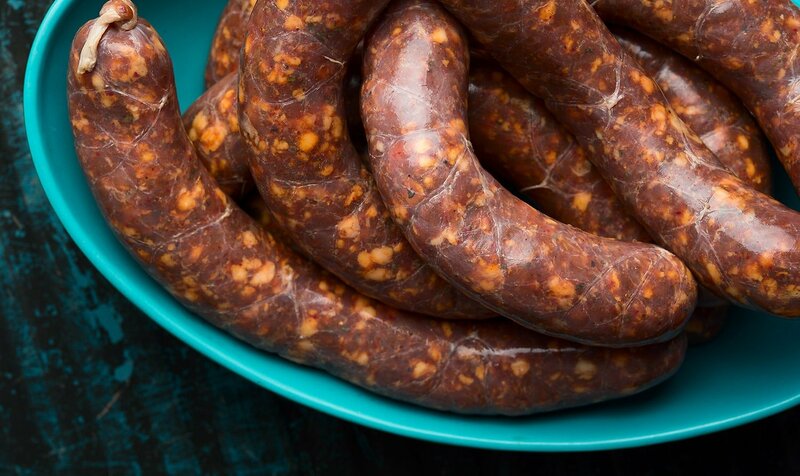 Hot Italian sausage can vary from cook to cook, but they all have red chile pepper and garlic in them. Most have fennel seeds, too, and some add paprika, as I do. Once made, these links will keep in the fridge a week. Cut the meat and fat into chunks that will fit into your grinder. Mix this with the salt and sugar and refrigerate overnight, or up to 2 days. You can skip this step, but your sausage will not bind as well. Get out about 15 feet of hog casings and soak them in warm water. If you want, flush them with water; this helps the stuffing process and will let you know if you have any leaks. Mix the pepper, coriander, hot paprika and oregano with the meat and fat and grind through a medium (6.5 mm) die. Chill the mixture in the freezer until it is about 33 degrees Fahrenheit. When the mixture is cold enough, add the fennel seeds, red wine and ice water and mix well with your (very clean) hands for 60 to 90 seconds. Your hands will ache with cold. 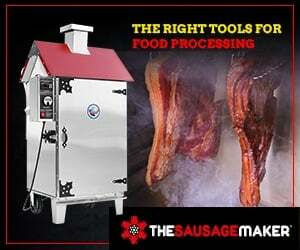 You'll know the sausage is ready when it coheres in one mass. You'll also start to see whitish streaks form on the side of the container you're mixing in. You can also do this mixing in a stand mixer on low. Pack your sausage into a stuffer and thread on a length of casing. Slowly ratchet down the meat to remove all air from the stuffer and the tube the casing is on. Leave about 4 inches of casing off the end of the tube; you'll use this to tie off later. Stuff one big coil of sausage rather loosely. If you have more sausage to stuff, keep stuffing large coils until you're done. To form links, take a coil and pinch off two links about 6 inches long -- the first link is the end of the coil, the second one up from the end. Roll this link away from you a couple times. Tie off the end of the coil. Now move down the coil and pinch off another link. Roll this link towards you a few times. Move all the way down the coil until you get to the end. Tie off that last link. Repeat with other coils. Gently compress each link looking for air pockets. Use a needle or sausage pricker to pop any air pockets. Gently compress the links to fill that gap. This takes finesse not to burst the casing. When all you links are ready, hang them to dry. At room temperature, hang an hour or two. Ideally, you'll hang links between 33 and 39 degrees Fahrenheit overnight. Barring that, leave them uncovered in the fridge overnight before eating or freezing. 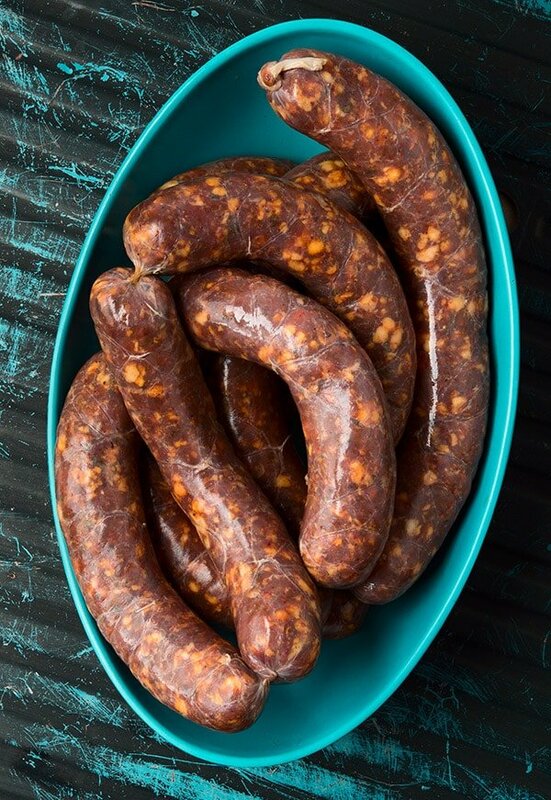 Browse through dozens of other recipes for fresh and smoked sausages from all over the world, right here on Hunter Angler Gardener Cook! 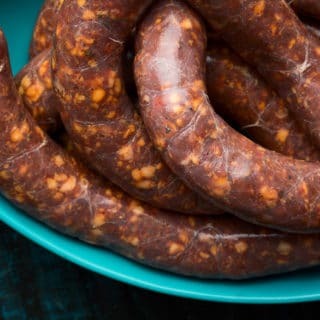 I’m new to the world of sausage and am starting with your sweet Italian recipe this weekend. Since I don’t own a stuffer at the moment, I’ll be leaving a couple pounds as ground and then making patties with the rest. Giving this on a try today- I did add minced garlic and some pepper flakes, cause well I can’t have hot Italian sausage without it! This recipe is going head-to-head against a recipe that we’ve used for years, we made 10lbs of each today..
Hanks sausage recipes are really good- we’ve tried several of them and they are all very good. Great job!